One of my favorite ways of sharing recipes is to make a mini cookbook album, so today I’m going to how to create a cookbook from a 4×6 photo album using an inexpensive $1 photo album. The steps for this particular album are simple and the supplies are very inexpensive. I think it’s great to give to anyone who might appreciate your recipes, but it’s perfect for new brides, someone moving into their first home, or a young adult heading off to college. Don’t feel like you have to make this only for gift giving – the summer is a great time to start documenting all of your family favorite recipes so that they be preserved for future generations. First, create your recipe cards. You can create them by hand on traditional recipe cards, or digitally. 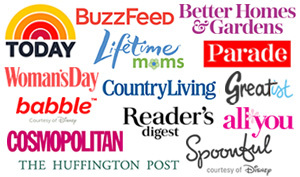 If you doing them digitally, you can create them in Photoshop or even your favorite word processing program. I also have a tutorial on how to make recipe cards in PicMonkey. You will also want to create a cover for your album (if your album can be customized). You will do this the same way you create your recipe card, except you won’t be listing a recipe, but rather a title for your mini cookbook. 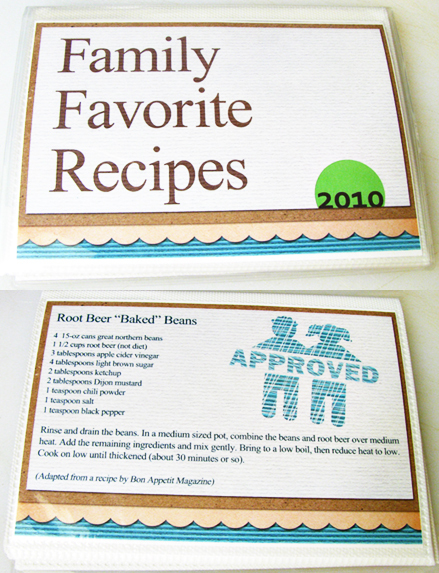 If you created your recipe cards and cover digitally, you will want to print them on your home printer, or if you prefer, have your cards printed at your favorite photo printing shop. Since these cards are the same size as a standard photo, the cost is fairly inexpensive. Also, many shops have the ability for you to upload your images online to their website and then pick up later. My preferred method is to place two of my 4×6” cards on a new document sized 8.5×11” and then print this document at on my home printer on cardstock. The screenshot below shows you just before I was about to print in Photoshop. Here is my printed digital scrapbooking recipe card and my cover. This image also shows my inexpensive 4×6″ photo album that I will be using for my cookbook. My album came with this flowers & lined themed cover which I will be removing and replacing with own cookbook cover. If your album has a clear plastic cover, but doesn’t appear to easily allow you to change out the cover it came with, you may be able to carefully cut a slit on the very top edge or the very side edge with a utility or craft knife (please use great caution! ), slide out the cover it came with, and slide in your new cover. Cut out your cards (if necessary) so that you have them as individual 4×6” cards. Slide your recipe cards into the album as desired. Add your cover to the front of your album. Your mini cookbook album is ready for gift giving!